I'm a longtime fan of Cate Anevski. If you haven't seen her work, then the first thing you need to do is visit her blog, her shop, and her site for fun stuff (it's the Bee's Knees!). It's a printable box that looks like it might be just right for a little elf to live in! And there is one for each of you...just download, print, cut and assemble. 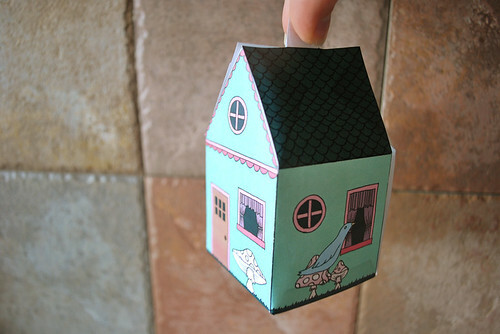 Get the printable house box here. Thank you soooo much, Cate! I'm going to be finding all kinds of uses for these this Christmas! is there a way to still access this download? this link seems to be broken... so sad! Hey Shelley Anne! It worked for me on my end, so try it again. But if it still doesn't work, send me an email and I'll get it to you that way. This project does not have a print icon. I was able to download it and save it to me computer but am not able to print it out. Because this is a PDF, you'll need to look for the print option in whatever software you use for PDFs.